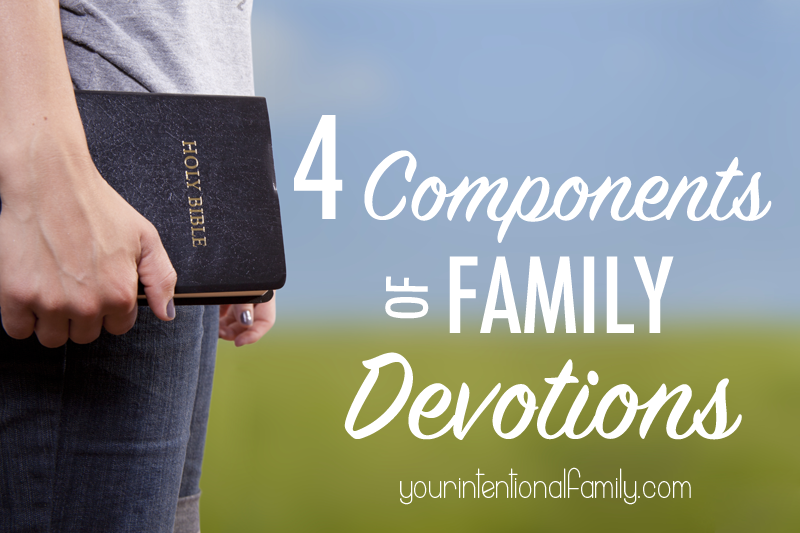 Several years ago I came across the idea of family devotions. Honestly, I had never heard of such a thing. I didn’t know family’s worshiped together or read God’s word together outside of Sunday morning services. But the more I read about family devotions and heard it talked about, I craved this time for my own little family. As you know I began to share these thoughts, and even some ideas for implementing family devotions, with Mark. 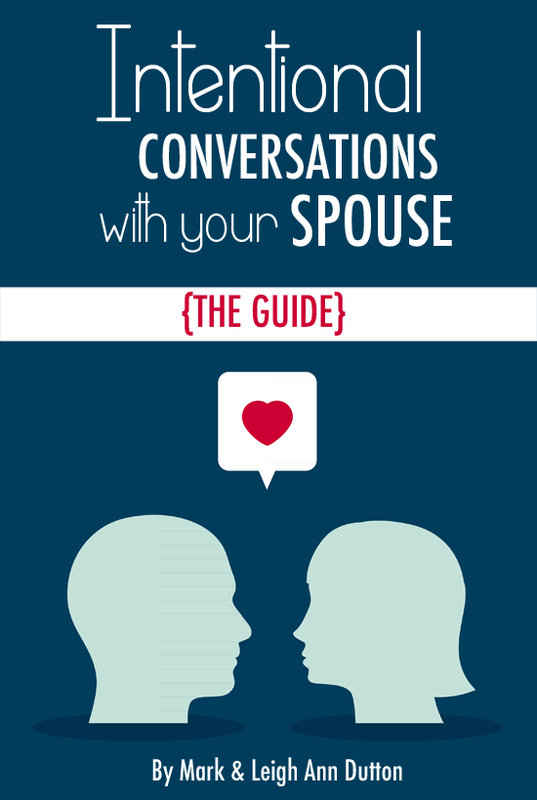 He was less than supportive at first, and it took us some time to piece together a systematic approach to family devotions. There seemed to be such a cloud of confusion around this desired time together. Neither of us knew what the time should look like, nor did we know how to make it work with a two year old in our midst. 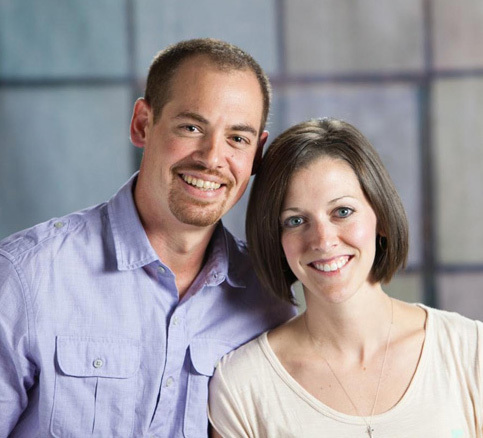 By the way, you can hear more about our journey into family devotions here. There are a lot of different names used for this time together. Simply put – family devotions (or whatever you call it) is a time set aside in your day to worship God in unity together. It is a time when you can sing praises together, read His word, memorize scripture, and simply pray together as a family. Why Should I Make Family Devotions a Priority? Family Devotions are a set aside time of fellowship that creates room to build a solid foundation of discipleship in our relationships as a family. Family devotions allow the family to gather around God’s word – to learn more of who He is and what He has done, and then walk in obedience together. In a way, family devotions level the playing field. We’re on this journey of living our faith together! During this time, the children hear Mom and Dad question portions of scripture, share their struggles to understand and perhaps obey particular texts, as well as see the ebbs and flow of a Spirit-filled walk with Christ as a family. Plus it allows God’s word to be central in our home, the basis for conversations due to our regular time spent studying and praising Him together. There are no more excuses for a family member “not knowing” it was wrong to question Mom or Dad’s authority. It’s not just because Mom or Dad said so, but because God said so (Ephesians 6:1-2). They also know that it’s not just a silly command of God, but a command that comes with a promise. The first command that comes with a promise as a matter of fact! We make Family Devotions a priority because Family Devotions afford opportunities to learn God’s word together in a safe environment so that we can apply God’s word together as a family. Perhaps you’re desiring to spend time together as a family in focused worship time, but you just don’t know where to start. We’ve been there! 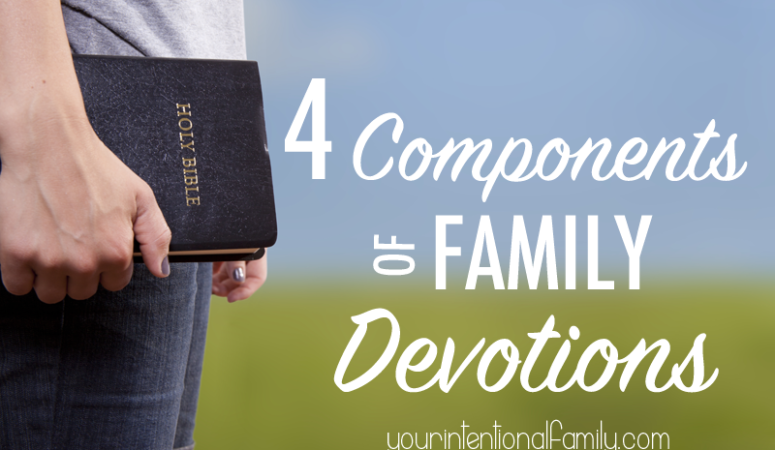 So, today I want to share with you four components of family devotions that we’ve found helpful to include during our time together. Having a set routine that we follow has helped us to build the habit of meeting together while keeping our time together organized and fruitful. We always start with singing a song (or two) of praise. This will vary from family to family. Make this a time of singing praise to your Father together! Don’t make it too difficult if music isn’t your gifting. It’s not ours! So, we just keep it simple. We always follow our time of singing with scripture reading. Depending on the age of your children, you’ll want to adjust to their attention spans. Don’t feel like it’s pointless to read only a single verse or two a day. If you have younger children like we do, keep in mind that you are making an investment into the future of family devotions. You are less focused on reading through the entire Bible and more focused on simply building a habit of meeting together around God’s word! If you have older children and family devotions are new to you, don’t feel like you need to teach what the scripture means just yet. Let your family get used to hearing Mom or Dad read the Word aloud. It can be a bit awkward for everyone at first. Let grace have it’s way and with time you can add in a discussion time. Again, when getting started it’s about focusing on building the habit of reading together! This is perhaps my favorite part of Family Devotions! Memorizing scripture together is like exercise. It’s just so much more fun when others are doing it too! Plus you can push each other further, hold one another accountable, and have fun learning God’s word together. There are many different ways to go about this, but I highly recommend this method for scripture memory. It’s effective, simple, and works for everyone no matter what age ranges you’re working with! Finally, we wrap up our time together in prayer. I believe this time will look (and should look) a little different from family to family. This time will grow and adjust with each season of life you find yourself in. It will also be influenced by the giftings distributed to each family. For example, some families have incredible musical talents and playing musical instruments and singing will be a large part of their time together. Others of us who can barely carry a tune in a bucket will likely not have magnificent instrumentals, but instead might spend more time in scripture memory or prayer. Not to mention, the time with older children in your midst will look very different from my family’s time with three children five and under. Regardless of what your family’s time together gathered around God’s word looks like, it will be a rich time of fellowship and unity within your family that you will want to make a priority. What about you? 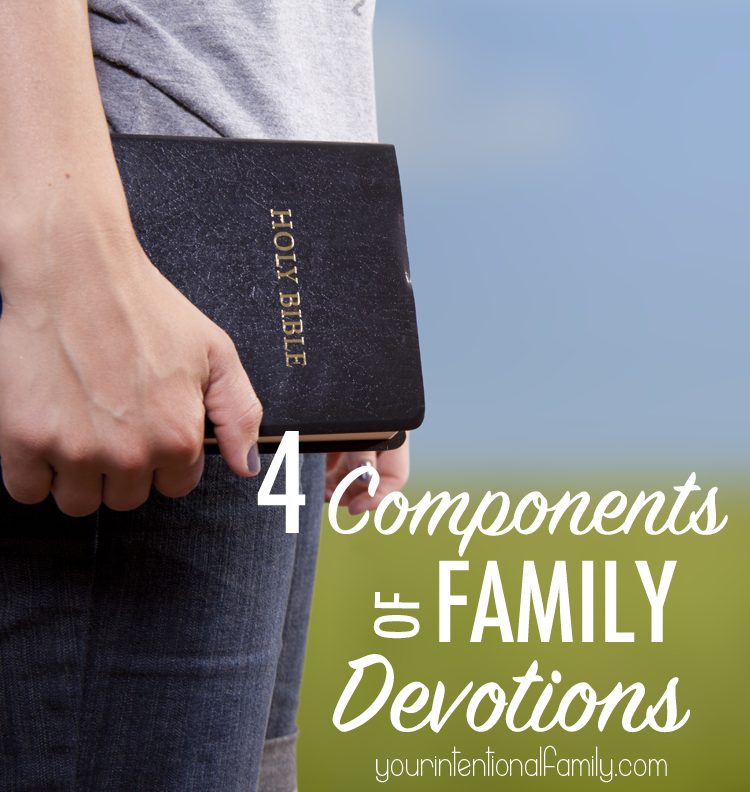 What do Family Devotions look like for you? This post contains our affiliate links. See our full disclosure policy here.